Antiques challenge. Anita Manning and Philip Serrell embark on the penultimate leg of their journey, which begins in Northumberland and finishes at auction in Carlisle. -This is Antiques Road Trip. Anita Manning and Phil Serrell. Do you not like being caressed by a beautiful Scottish girl, Philip? A lot of people have said that through the years. Nothing else. she blew the budget on the last leg. It could have been a lot worse, Phil. Could have been a lot worse. profits at the last auction, including over £100 on a pub table. The trusty 1970s Fiat 500 is their chariot this week. -I think I'm quite... I'm getting to like this car. -You mean you're growing into it? -I think it's growing into me. So far, Anita has had a journey of ups and downs. She has £258.30 for the day ahead. and has a rather sizeable £399.40 stuffed in his back pocket. kicked off in stunning Windermere in the Lake District. before heading back south to end in the village of Crooklands in Cumbria. and we will auction in Carlisle in Cumbria. Hello! What's going on here? I love this bit of the coastline. It's glorious, isn't it? The skies are blue, the water's lapping gently on the shore. Cor, they don't half treat themselves, do they? -Are you getting all romantic? -With you, darling, any time! -I'm getting back to the car. We'll have to keep an eye on you, though. in the village of Amble, is her first shop of the day. And they love a bit of vintage in here. -Hello, Anita. I'm Tony. Very nice to meet you. Oh, it's lovely to meet you. Lovely to meet you. The cakes look delicious, but it's antiques we're after. With eagle-eyed precision, Anita finds something. Hey, snazzy shoes! I think this is quite a sweet little thing. but what I like about this is the illustration. I don't know, early 1800s. And it's still going on today. And this little stool might have been sold as a souvenir at the fair. And what we have here is this rather naive painting. poor old horse met a sticky end after carrying six people to the fair. Anyway, ticket price is £23. Anything else, my dear? I think that this has got bags of style. It's a table lamp and a little cabinet. into something which had what we call the New Look. The New Look began with Christian Dior's Spring collection in 1947.
in design within the home and workplace. because it needs this done. would like in their 1950s interiors. Remember, it's priced at £72. -On the ticket, it tells us that it needs rewired. Is there a drop-dead price that you could sell that for? Simply because of the rewiring issue? Do you want to make me an offer? -An offer that you can't refuse? -I could come down to probably about £50. -but I have to sell it in auction, you know? And it's got that thing on it. -45 sounds fine to me. -Is that all right, are you sure? What about the milking stool, then? and it was this little novelty milking stool. -What's the best that you can do on that? I could do a special price for, what, £12 for that? Put it there! Lovely. £12, I'm delighted with that. I think that it's just an absolutely fun thing. The 1950s lamp and cabinet for £45 and the little milking stool for £12. That's lovely, thank you very much. to the coastal village of Bamburgh in Northumberland. The area boasts one of the largest castles in the country. this castle was once the centre of a revolutionary social movement. providing health care, education and the country's first lifeboat station. Phil is meeting with curator Chris Calvert to find out more. -Hi, I'm Chris. How're you? -but this is just absolutely stunning, isn't it? of the castle to manage affairs. a much-needed life support for the people of Bamburgh. -It certainly was in its heyday, yes. What's a castle doing with a windmill? he could then sell to the poor people - corn at a reasonable cost. come up and they could grind their own corn for free in the windmill. Free education was next on his agenda. teaching children who would have otherwise no access to learning. They are the original schoolbooks, yeah, from the 1700s. There are two schoolbooks here... Obviously mathematics was very big. -I know, very complicated isn't it? Well, this is all mathematical, really, isn't it? What else did they teach here? They taught reading, as well, and writing. hence the spinning wheel that we have here. So it was always an industry for life, wasn't it? It is, giving them life skills. I mean real life skills. that they worked on, but why have we got a sedan chair here? but this one was actually used as an ambulance. providing free medical care and supplies. the surgery was treating over 1,500 patients a year. but Dr John Sharp is still very much present. or maybe beseeching him to take their children into the school. -you can see that there's ship foundering. on the perilous Bamburgh coastline. coastguard system thought to be the first of its kind in the world. if it was sinking or whatever, did they help them, or what happened? Yes, they had a system of signals using these guns here. These are actually the guns used. -that help was on its way. -And what sort of help would it have been? were paid for by the Crew Trustees here. Where did all the money come from to fund this? He put up a lot of it himself. But the Crew Trustees did have quite extensive lands, as well. when it was taken over by the RNLI. that lasted at Bamburgh for over 100 years. Chris, it's been absolutely fantastic. I've got to go and find that dreadful little car. Anita's travelled south west to the Northumbrian town of Corbridge. that romantic novelist Catherine Cookson lived. -Alison is holding the fort here today. -Ah, it's lovely to be here. -And I can't wait to have a look around. can I give you a wee shout? -Yeah, of course, I'll just be here. -OK, thank you. Thank you. Anita should be able to snaffle up something. We know how she loves to shop. I absolutely adore this mirror. It's an Art Nouveau mirror, made probably between 1900-1910.
of perhaps a sandalwood or an exotic wood. ..a four-figure sum, I would definitely go for it. This is actually a Liberty mirror and it's priced at £1,800. Shame you've only got a little over 200. But I've already seen something that I quite like. and it's a little Art Deco doll's three-piece suite. I think it's quite a nice little thing. I think I might ask her about it. maybe by an amateur carpenter or maybe even by an apprentice. which I think's quite charming. If that was life-sized, I wouldn't mind it myself. And it's a snip at £14. Is there any movement on that, Ali? -Could do the set for £12. -I think I might take that. -but I find that quite charming. £12 secures the little Art Deco-style three-piece suite. As for Phil, he's journeyed south to the city of Newcastle. to his usual rusty offerings. Ha! -Hello, Philip, how you doing? -Yeah, good to see you. You are? I'm Giuseppe and this is Fern Avenue Antiques Centre. Welcome. You've got some stuff, you, haven't you? So what's cheap, then, Giuseppe, what's cheap? We've got a pair of canaries up there, so they're double cheap. he's got his eye on something else. Giuseppe, what's that trunk underneath there, how much is that? Er, we'll get it out. -All the original address there, come via Dieppe to Newhaven. Unusual to have the key. Are you all RIGHT there, Phil? Undecided on the trunk, he moves on. No great age, how do you know it's Scottish? Well, because it's shaped like a thistle. And it's a firing glass. and then it would be... banged on the table. -That might be a possibility. -That might well be a possibility. Masonic items can be very sought-after at auction. That could be a good choice, Phil. -This is a Masonic jewel. It's no big deal, but it's just a nice little Masonic jewel. but I'm sure we could do something. -That your problem, my friend. and Phil's got his eye on another big wooden trunk. What's that one up there, then? How much is that one? That one's cheap and cheerful, 40 quid. What?! Can I have a look at it, please? and the first one I looked at. -Sometimes you can buy things right. -I'll give you 30 quid for it. You know those... That little bit of Masonic glass? -And that little jewel thing? -..the three bits off you for 60 quid? The glass, the jewel and that trunk. There wasn't an ounce of emotion there, was there? -I'll meet you in the middle. -Giuseppe, you've been as good as gold, mate. £65 and three, you're a gent. -No problem, best of luck. -Phil now has two lots. £30 for the Masonic firing glass and jewel and £35 for the wooden trunk. This signals the end of a very busy day. It's time for our weary duo to turn in and get some shut-eye. Anita's in command of the Fiat 500 this fair morning. -is that you work with your old mates, don't you? And those friendships stay true. not convinced your driving's got any better! Let's have a refresher on their shopping trip thus far. and the Art Deco three-piece miniature suite for a doll's house. This gives Anita £189.30 for the day ahead. He has a rather lovely £334.40 left. We have traversed from one side of England to the other side. -I don't know how that happened. -And where are we now? and Phil is going for a shop in the town of Moffat in Dumfriesshire. What will he uncover in here? You've got a bloomin' room full of stuff here, haven't you? A wee bit of everything, yes. A wee bit... I love that, "A wee bit of everything!" And he's off. On the hunt. on the dining table and they're for resting your knife on. what they aren't is little glass dumbbells. But they're knife rests. Glad you cleared that one up, Phil, thank you. What is he on to now? I quite like that. That's just a company seal. but you also had THE company seal. That's a precursor of a publishing package on a computer. That's priced at £79, which is a whole load of money. That's a possibility, isn't it, you know? Phil's seeks out the lovely Linda to find out more. So that... I just thought that was quite nice. I don't know what on earth you'd ever do with it. It is nice. I mean, as you say, probably not a lot of practical use. I think at auction, that might be £40-£60 worth. What would be the very best you could do that for? Bottom line on it, 30. -I think I'd like that. -I want to look at on the way out. And Linda's treating him to a special part of the shop. Ooh-ah! If you want to come through here, we'll go upstairs. -So, Linda, this is sort of the hidden storage area? This is where all the old antiques go to die. either they go out or get sent auction. I like the ladders, how much are they? I think we actually use them, dare I say! This is not a shop, it's a museum! Actually, it is a museum, isn't it? Well, the floor downstairs, yes. So the ladders are definitely not for sale? I think they're definitely still in use. -Do you know, I don't think those confirm to health-and-safety rules. You don't want to be clambering up stuff like that. I think Linda might see through that, Phil, heh! After a snoop about, he's just got one thing on his mind. he might let you have them. It'll be 30 quid, something like that. how would that grab you? I suppose we could. Seeing as it's you. You're an angel. You're an angel, thank you so much. Success! £30 for the ladders and £30 for the seal press. is birthplace to local legend Thomas Carlyle. with intellectual giants such as Charles Darwin and Alfred Tennyson. as some of his work became associated with slavery and the Nazis. to find out more about this formidable man. David, tell me about this place. village and they built this house around about 1794. What sort of family were they? Despite Thomas' humble background, his parents focused on his education. Thomas realised that he wanted to become a writer full-time. major work in 1837 on the history of the French Revolution. and put Thomas firmly on the intellectual map. what was next for Carlyle? and for future writings, they were all popular. and control the purse strings. This weighty account of the French Revolution wowed Victorian readers. They loved Carlyle's revolutionary, dramatic style of writing. It also inspired one of the world's greatest works of fiction. It sounds like a wonderful time. Of course, Dickens was influenced by Thomas. -and the two families became great friends. great friends for the rest of their lives. Used Thomas's History Of The French Revolution as his research material. in maths, history and philosophy. and that true progress can only take place under the control of great man. relating to several of these men. Should take a lead from some of them, certainly. As Thomas' fame grew worldwide, so did the controversy surrounding him. His ideas at that time didn't always find favour. that he didn't join the abolitionist cause at all - quite the opposite. He really wanted to restore slavery, but in a different form. throughout the British Empire, would tarnish his reputation. But he continued to publish. focused on his established ideas of the hero. Tell me a little about the latter part of his life. and that had a very drastic effect on Thomas's health. that he almost became a recluse and he had to be looked after. Thomas was heartbroken and retired from public life. and historian that he was offered a burial place at Westminster Abbey. Thomas being Thomas, however, turned that down. the world continue to visit this humble little cottage in Ecclefechan. our pair are heading for the village of New Abbey. -So we've got one last shop between us, haven't we? -I know what you could buy. The mischief-makers are sharing their last shop of the day. Bit of a tight squeeze there, Phil! -Ah, thank you, darling! What a gentleman. Well, he can be, sometimes. Anita's visited Admirable Antiques before. -It's lovely, lovely, lovely to see you! I've brought my wee pal along today. I've brought my wee pal along, as well. Phil's got over £270 to play with. On the way in, there was a curling stone. I'm in Scotland, it would be a real shame not to buy something Scottish. but I'm going to go and have a word with the boss man. ..that doesn't have a handle on it. -You have another handle, have you? You haven't got anything else like that? That's peculiarly Scottish? -I've got a tiny one that you might be interested in. Blimey, that is a tiny one. -These are from Ailsa Craig, aren't they? It is a granite, yes. in the Firth of Clyde has been quarried for granite. It's one of only two sources for the production of curling stones. And what's your ticket price on that? -What's the best you can do on it? That's just way too much money for me. And how much is this stone without the candle in it? 75, but I could perhaps do you a package for the two. -Honestly, I think 50 is my limit. -If you could do that, I'll have them. -You're a gentleman, thank you very much indeed. A little-and-large set of curling stones for a generous deal of £50. but Anita's on the prowl to spend her cash. She's got just under £200 in her purse and she looks determined. called, would grace the mantelpiece of every Victorian kitchen. generally flat on the back and are undecorated there. in a Victorian house to add some interest. high prices in the saleroom. But they have gone out of fashion. What's Anita got her eye on now? with a lovely pair of stylish cuff links. So cuff links are doing well and I quite fancy these. The combined ticket price for the two items is £52.99. I've found two things really that I like. ..in the region of 25-30. £27 for the Staffordshire flatback and £5 for the dapper cuff links. That completes this late shopping trip. the milking stool, and the little doll's house three-piece suite. Anita was canny with her cash - she spent £101. the set of ladders and the little-and-large curling stones. Phil spent a total of £175. Now for the juicy bit. Ha! What do they think of each other's items? I love the company seal! Got to make a profit on that. and that really little three-piece suite. I think that's really cute. but it's a good solid profit for him once again. to auction in the city of Carlisle in Cumbria. I think a wee bit of sartorial might be the thing for you. I'm clean-shaven, this is like a baby's bottom! Yeah, give the fellow a chance, Anita. Let's hope lovely Carlisle will give them lots and lots of profits. H&H Auctions is their penultimate battleground. Don't drive straight in! Stop! Dear me! I feel like I've been welded into that thing. -Yeah, I've got a lot to make up, Phil. Our auctioneer today is Stephen Farthing. What does he think of Anita and Phil's lots? and I'm sure a lot of people will recognise that. It'll probably go for the £50-£60 mark. very simple and very stylish. So, again, I'm hoping that they might do well. Make yourself comfortable, the auction is about to begin. First up are Anita's stylish cuff links. 5, 8, 10 on the books. 10 bid, at 10 I'm bid, 10 for the pair. -Right at the back, £12 bid. At £12, at £12 bid, right at the back at £12. Tidy little profit there, Anita. Great start. -That was short and sharp. Next are Phil's curling stones. Straight in at £10 on the books. -..30, at 32, 35, 38, 40. Despite that series of bids, it's a loss, Phil. Next, Anita's three-piece suite for a doll's house. A nice little lot there. right at the back at 12. 14, new bidder. At £14, 16. -18, £18 on my right, £18 in. It's a miniature-sized profit, but it all adds up. I'd sort of kind of settle for that, really. Back to Phil and his big wooden trunk. A bit of interest in this one. we'll start the bidding at 20, 25-30 on the books. 30 bid, at 35, 40, 45, I'm out at 45. -Thank you, Lord, thank you. -Front row, lady's bid. 65, then. That's more like it, good on you, Phil. Big, hulking furniture scores well with this audience. -Never any doubt, never any doubt in my mind at all. Phil's currently in the lead, Anita. Can your Staffordshire flatback show him who's boss? -At 44, then, all done at 44. Commission paid. -I have to say, it sort of deserved that, didn't it? Can Phil take the lead once more with his lot of Masonic items? A bit of interest again. 5, 8, 10, 12, 15 on the book, 18, 20, 22, 24, 26, I'm out. -All done at £26, then? Cor! Someone's got a good buy there. -It didn't double its money then. -I really thought it would. That was a nasty thing to say! We'll start the bidding at 2, 5, 8 bid, £8 bid. 10, I'm bid 10. at £10. In the room at £10, in the room and £10, 12 at the back, £12. -All done at £18 in. Another tiny profit, but you're still in the lead, Anita. because I thought that was worth a lot more than that. Can Phil's shop-style ladders help him bulk up his profits? -We'll start the bidding at 20, 30, 40, 50, 60 bid. 70. At 70 bid, at 70 bid. -Lady's bid at £130, then. That huge profit has catapulted you into the lead. That's probably the stairway to success, isn't it, really? It's taking a step up, isn't it? Oh! Enough of these terrible puns. Now, Anita's 1950s standard-lamp and cabinet combo. We're straight in at 20, 30, 40, 50 on the books. 50 bid, at £50. 55, I'm outbid 55. I've 60, and 5, 70. 75, right in the corner at 75, then, at £75. In the corner at 75, then... All done. The 1950s look is definitely in vogue with the Carlisle bidders. I think you've done very well. No, it's a cool thing. No, it is. It's all a matter of taste, isn't it? Now their last item of the day, Phil's company seal press. We're straight in at 20, 25, 30 on the books. I'll take two, if it helps. ..38. I'm out at £38, it's in the room at £38. That's a good result, Phil. Looks like the bidders like your style. Let's get the sums done over a cup of tea. Who will be the jubilant winner of this crucial leg? giving her a total of £294.24 for the final leg of the trip. Phil started off with £399.40 and takes the crown today. giving him a handsome sum of £469.58 to carry forward. Well, I tell you what, I think you're still driving. So I think you pulled ahead even more in this auction. I thought you didn't like Anita's driving, Phil? Next time, a thrilling final leg of the Road Trip. -Have you got any stockings on? Well, this certainly isn't a "wee brooch". -..and Philip's found his soul mate. -My hero, look! Hello, Spocky! 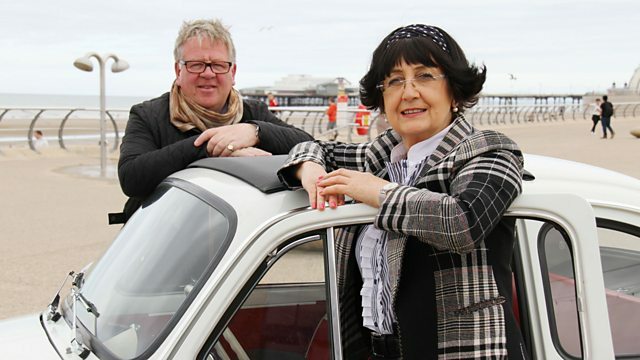 Anita Manning and Philip Serrell embark on the penultimate leg of their journey, which begins in the village of Amble in Northumberland and finishes at auction in Carlisle in Cumbria.